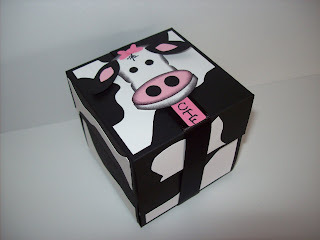 My daughter is a member of the Cheer Tumble Fly Dance Crew and their mascot is a cow. I made these cow magic boxes for their magic box raffle to raise money for the club. 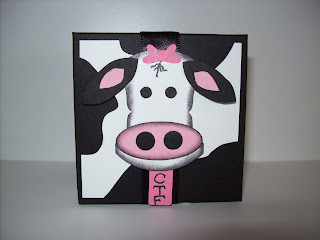 Card Stock: Basic Black, Whisper White, Regal Rose and Pretty in Pink. Accessories: Basic Black Satin Ribbon, Stamping Sponges, Two Step Owl Punch, Oval Punch, Round Tab Punch, Jewellry Tag Punch, 5 Pedal Flower Punch, Stampin Write Journaler, Paper Snips and Adhesives.